The automobile is an integral part of modern history. From the Model T to the T-Bird, from the Volkswagen Beetle to the minivan, from the Cadillac to the Camry, the world is car crazy. But we sometimes forget every vehicle is just a collection of components. Here are the origins of some of those components. As is the case with many automobile accessories, nobody knows for sure who came up with the idea for the glove compartment (or glove box), but automobile historians say this honor should go to the Packard Motor Car Company and their Packard Model B, introduced in 1900. At the time, cars didn’t have dashboards like the ones we know today. A dashboard, or dash, was a rectangular piece of wood, metal, or leather affixed to the front of a horse-drawn carriage to stop mud from being splashed—or dashed—onto the riders. Other automakers soon started adding compartment-like features in place of old-fashioned dashes. The modern-looking glove compartment, with a drop-down door, first appeared in the 1920s. Bonus fact: Credit for the name “glove compartment” is commonly given to British female racing legend Dorothy Levitt—but that’s a bit of a stretch. In her 1909 book, The Woman and the Car: A Chatty Little Handbook for All Women, Levitt advised women drivers to always have gloves handy for driving, saying, “You will find room for these gloves in the little drawer under the seat of the car.” While it’s possible this may have influenced the naming of the handy compartment, they weren’t actually called “glove compartments” until the late 1930s. The first electric headlights appeared in 1898, on the Columbia Electric Car, made by the Electric Vehicle Company of Hartford, Connecticut. But their filament technology wasn’t up to the needs of an automobile, and these dim and fragile headlights didn’t catch on. 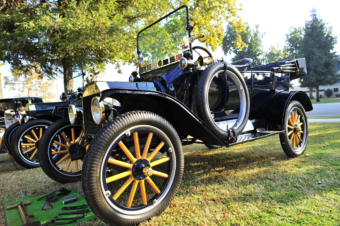 When electric headlights became popular after Cadillac brought them out in 1912, incidents of drivers being temporarily blinded by oncoming lights became a real problem. This led to the introduction of the first “low-beam” headlights by Cleveland-based Guide Lamp Company in 1915. They didn’t work the way modern low-beams do. You had to get out of the car and tilt the headlights down manually. 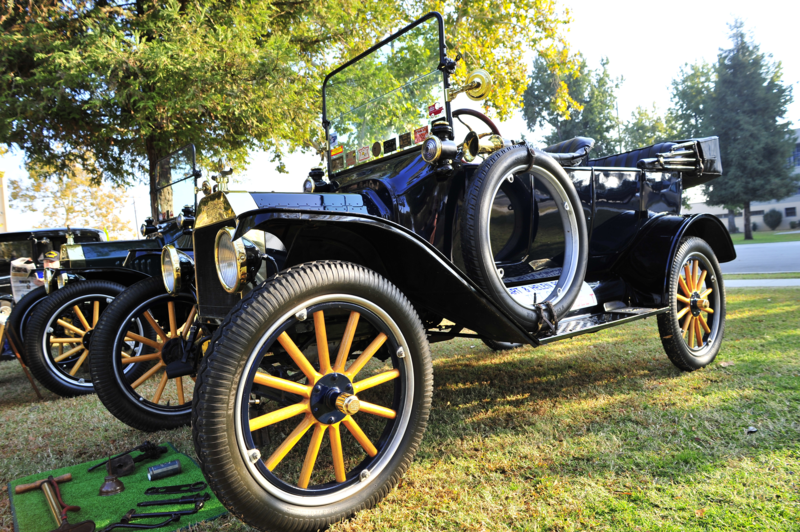 Cadillac improved on that in 1917, with a lever inside the car that physically tilted the headlights downward. The first dual-filament headlight, which could be changed from normal to low-beam with a switch inside the car, was the Bilux bulb, produced by German light company Osram, introduced on German cars in 1925. Similar technology appeared in the United States that same year, and in 1927 the “dimmer switch” was introduced—a foot-operated button located on the left side of the driver-side floor, that lowered, or “dimmed” the headlights’ beams when pushed, and raised them back to normal when pushed again. The dimmer switch was standard on virtually all American cars until the 1970s, when the trend changed to steering column-based, finger-controlled high and low beam lever switches. Bonus fact: In 1920 one of Henry Ford’s former employees, C. Harold Wills, founded his own car company, Wills Sainte Claire. In 1922 he created a lasting automobile innovation when he mounted a small lightbulb on the rear of the 1922 Wills Sainte Claire A-68 Roadster. What did it do? It lit up when the car was put into reverse—making it the world’s first backup indicator. 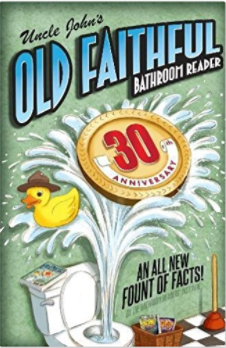 Bonus fact: Other splash-protecting devices were patented even earlier than March’s mudflap, including an “anti-splasher” invented by William J. Rothman of New York City in 1922. Unlike mudflaps, which hang behind a vehicle’s wheels, the anti-splashers hung outside the wheels where, according to Rothman, they would prevent water and mud from being splashed onto pedestrians during rainy weather. That invention—alas!—did not come to fruition. Early automobiles used bells, whistles, and squeeze-activated bulb horns to warn pedestrians and other drivers of their presence. But as cars got faster—and more dangerous—more powerful horns were needed. That led to the development of horns like the Gabriel horn (named after the biblical angel), invented by automotive pioneer Claud Foster. It consisted of several brass pipes mounted along the side of a car, and connected to a car’s exhaust system. By stepping on a pedal, the driver could divert exhaust to the horns, thereby producing a powerful, brassy multitone blast. Klaxons were available in electric and hand-powered versions, and were extremely popular in North America and Europe into the 1920s, when they began to be replaced by more modern “beep-beep” horns. The first car to have an electric horn operated by a button on the hub of the steering column: the Model C Roadster, produced by the short-lived Scripps-Booth Company, based in Detroit, and released in 1915. Internal combustion engines create a lot of heat, and will stop working—and even blow up—if they get too hot. Early engine manufacturers countered this by developing water-based cooling systems: as the engine runs, water is circulated through passages built into its metal housing, thereby keeping it cool. In early stationary internal combustion engines, first used in the 1860s, this was fairly easy—pipes could be connected from a water supply directly to the engine. On automobiles, of course, that wasn’t possible—the water supply had to be mobile too. Early models had a metal water tank located above the engine, but this was very inefficient, because the heat of the engine would quickly boil the water away, meaning you couldn’t go very far without replenishing the water supply. Attempts at designing efficient engine cooling systems failed for many years… until 1901, when German automobile pioneer Wilhelm Maybach finally designed the forerunner to the modern radiator for the Mercedes 35 HP, often called the world’s first modern automobile. Description: hot water from the engine was pumped into the top of a rectangular holding tank situated at the front of the car. The holding tank was made up of thousands of narrow tubes made of very thin metal, all exposed to the air—which allowed it to act as a liquid-to-air heat exchanger. As the hot water flowed through the tubes, the heat was transferred to—or radiated to—the metal tubes, then from the tubes to the air, cooling the water. The water would then be pumped back into the engine via another pipe at the bottom of the radiator. And because the radiator was at the front of the car, the air that flowed through it as the car moved down the road added to the cooling effect. Got a light? The cylindrical, plug-shaped electric cigarette lighter—actually meant for cigars—was patented in 1921 by J. M. Morris, of Rochester, New York. The automatic “pop-out” cigarette lighter was patented by Lawrence E. Fenn, for the Connecticut Automotive Specialty Company in 1956. Cold as ice. Water expands when it freezes, and if water inside an engine is allowed to freeze, it can crack the engine’s block. That’s why we use antifreeze—specially made fluid that lowers the freezing point of water—in radiators instead of just plain water. The first radiator antifreeze fluids were developed in the 1920s. Hot stuff! How does a car’s heating system work? Hot water from the engine is diverted to the heater core, which is basically just a small radiator that sits just behind and below the dashboard. A fan forces air through the heater core into a vent system that blows that heated air into the car. The heater core system was developed by General Motors in 1930. Misty. The electric window defogger was invented by German engineer Heinz Kunert in the early 1960s. Glass with class. The first power windows appeared on the Packard 180 touring sedan in 1940. Howdy! Big fan of all the YT channels, TIFO, Realpolitik, TopTenz, Bio and of course the oft-forgotten and somewhat neglected self-named channel! To business: there is an error in this article, which I know you did not pen, but nonetheless. The acetylene was supplied by water being dripped slowly onto chunks of calcium carbide. Same way early miners helmet lanterns worked. I will spare you an overly detailed description, as you can easily look it up. Hope this is helpful, or at least interesting. Interesting, in french the verb to horn is “klaxonner” – clearly borrowed from Klaxon.